Reflecting on Carol Dweck’s ideas about fixed and growth mindsets, we had a good “growth mindset” performance today. Several players were asked to play new positions, and they found new areas of success. Likewise, many of our matches went to a “no-ad” deuce, and we unfortunately loss the majority of those points. Overall, players performed well on Tuesday’s goal to increase the intensity level of our footwork and overall court play. Loomis was a strong squad and provided great competition as well as solid ground strokes. Team shout-out goes to Chloe and Kate for their first doubles match, which was well-played by both teams and evolved into the longest match of the day! 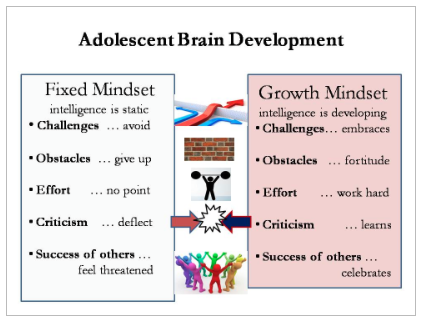 This is a great chart….I just realized that most of my clients are on the left – fixed mindset mode and I HAVE to be on the right – Growth Mindset mode in order to be encouraging and move them forward. Tricky. I get excited about the ones that are in Growth mode with me. I just didn’t realize why.